I have bad news for you. That is not a German uniform. It actually looks American. My guess is the woman is Italian and was murdered by partisans in the closing days of the war when partisans went on a rampage against fascist sympathizers. 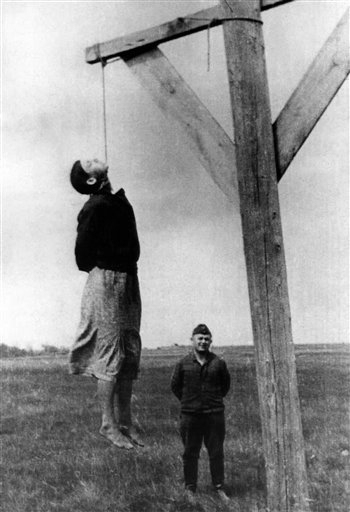 Look what these same people did to Mussolini, hanging him upside down with his woman. My guess is that an American soldier would have a weapon and full “web gear”(equipment belts. The soldier in question could be German or slavic and be a security guard with Orgainization Todt (German Labor Service). Security guards wore partial uniforms and were armed to keep the forced workers working and also to protect the more voluntary workers from Partisan attacks etc. I hate to disagree, but neither the uniform, nor particularly the hat look like a US outfit. Although, I’d guess if you’ve got an ax to grind you could see that. His cap doesn’t look U.S. to me (blowing it up to check).